Don't feel like cooking? 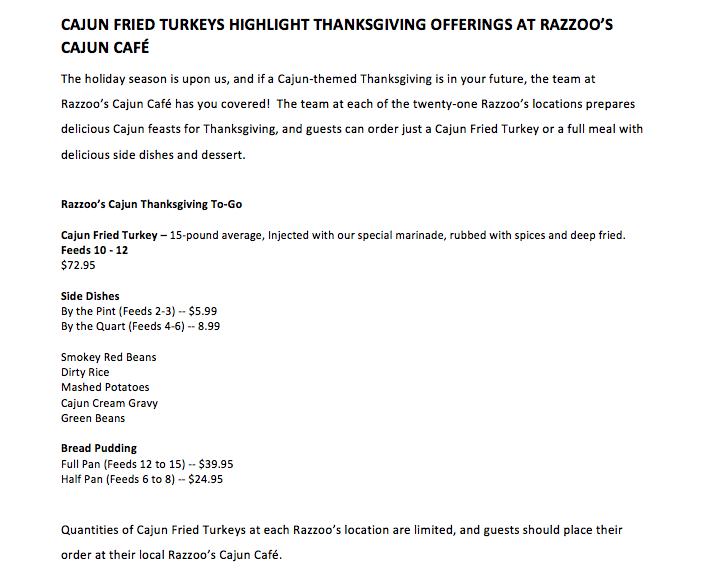 Let these restaurants do it for you. 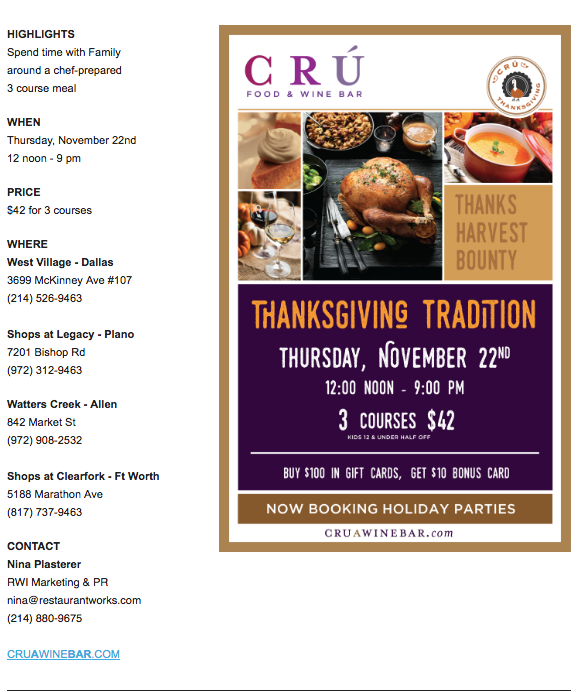 “Chef/Owner Brian C. Luscher of The Grape will personally cook your Thanksgiving Feast. 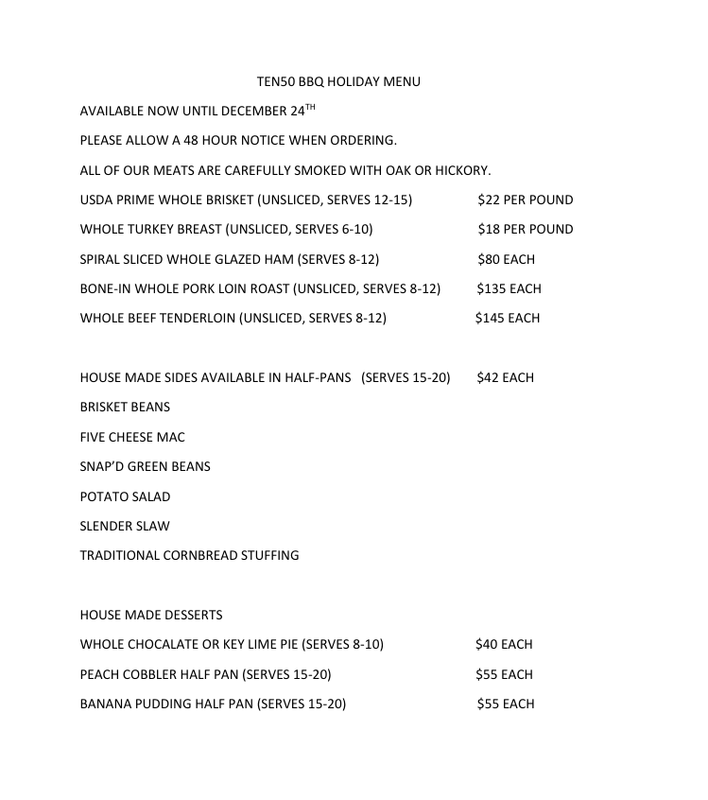 With a full range of holiday options, The Grape is now taking orders for complete natural, smoked turkey dinners and homemade holiday desserts to reheat at home. 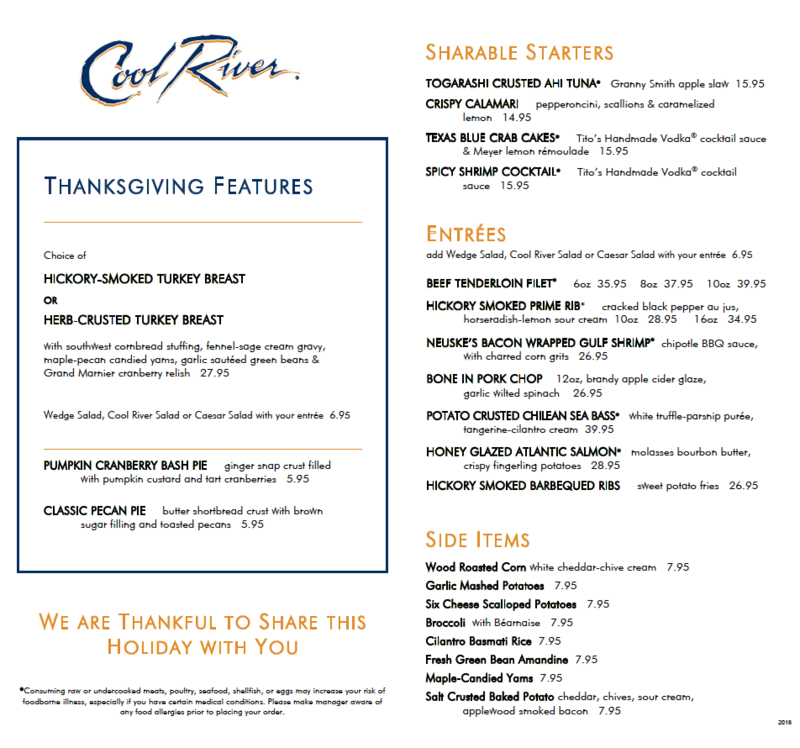 Choose from a Post Oak Smoked Natural Turkey Dinner (serves 4-6 or 10-15 from $180-$330) with all the fixings and your choice of two sides. 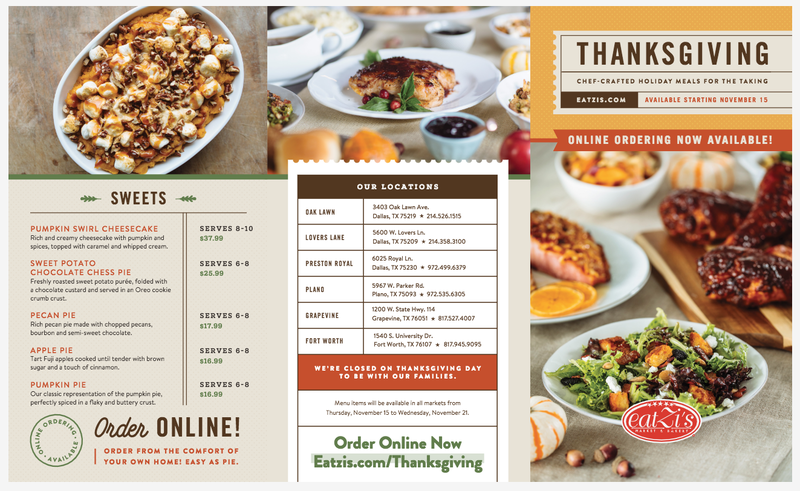 Available sides include maple-whipped sweet potatoes, sour cream and chive mashed potatoes, Luscher’s sausage and cornbread stuffing, sage, golden raisin and Texas shiitake bread stuffing, green beans with slivered tomatoes and toasted almonds, The Grape’s famous mushroom soup and creamy corn with roasted red peppers. 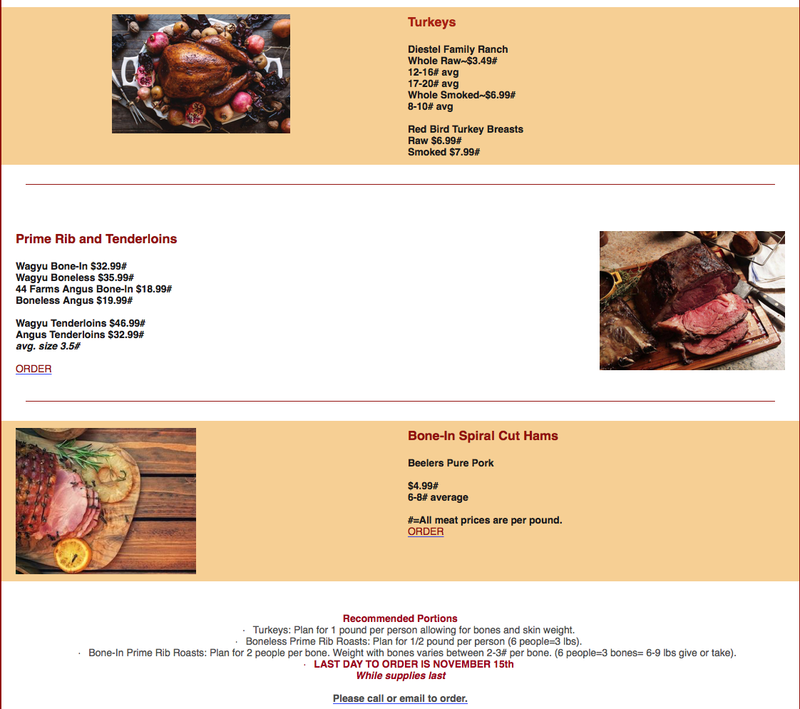 Niman Ranch brown sugar-maple glazed hams are also available for $85. 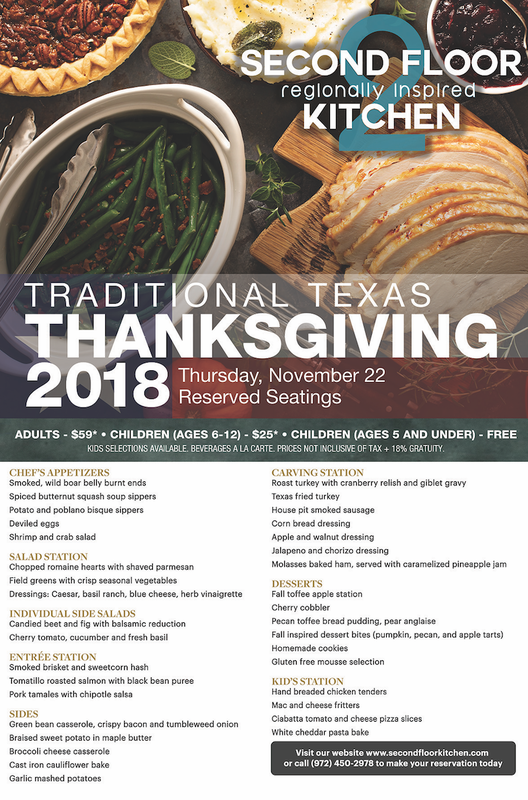 Traditional desserts including the famed Old Grand Dad pecan pie, pumpkin pie and a caramel apple crisp ($25 each) serve 8-10 people. 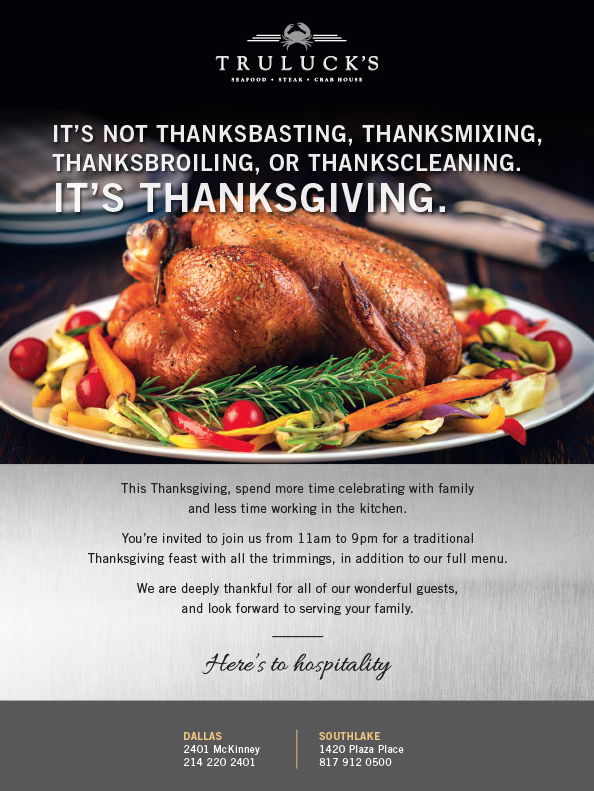 “Design District gastropub Meddlesome Moth and Chef Robbie Lewis serve up Thanksgiving Day brunch from 10 a.m. – 3 p.m. with a featured turkey plate in addition to a la carte brunch offerings. 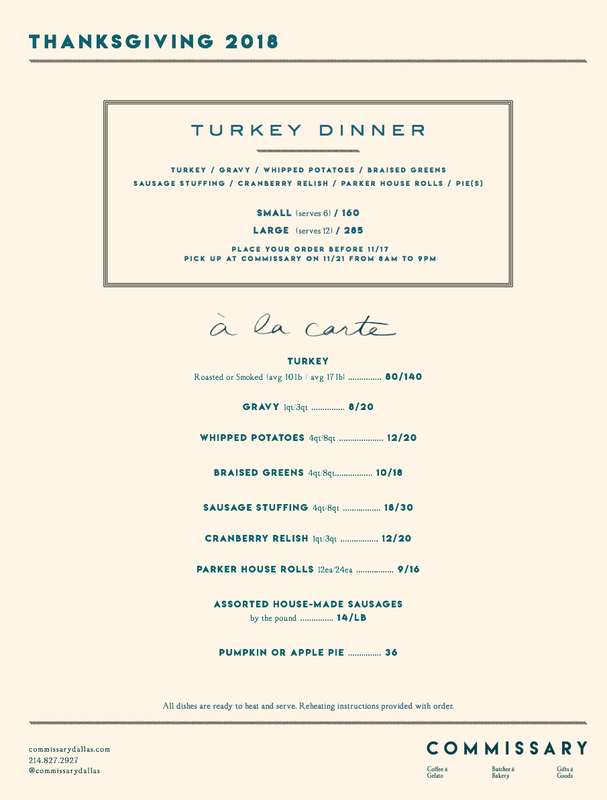 The Moth Turkey Plate includes Confit Turkey Breast with choice of three savory sides including sautéed Brussel sprouts, pumpkin tamales, whipped sweet potato, whipped potatoes, confit duck stuffing and more. 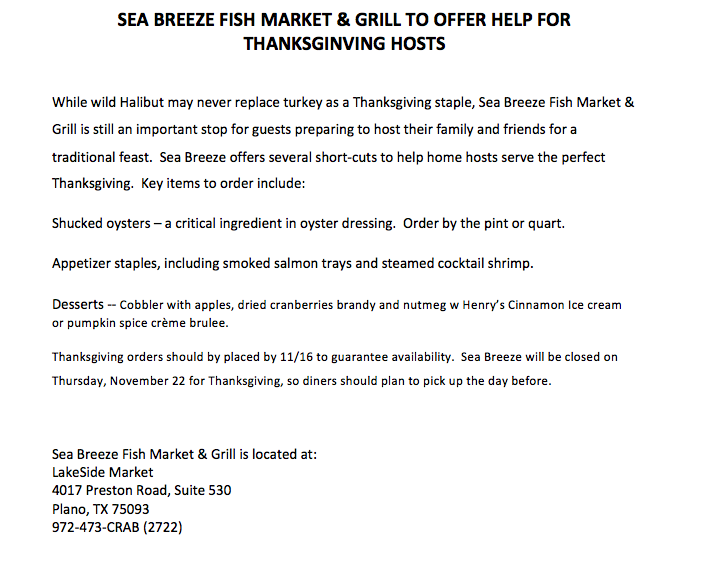 Cost is $25 per person. 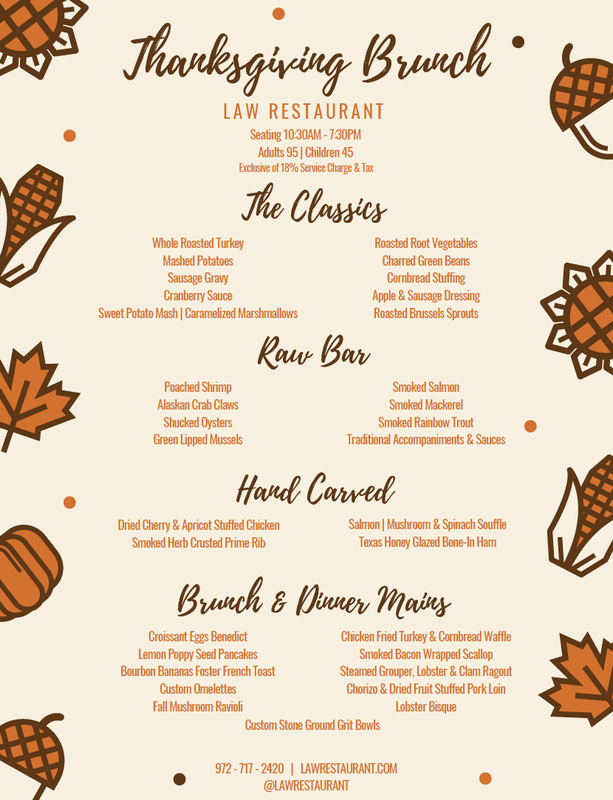 Additional specials include Spiced Pumpkin Soup with Pepitas, Cedar River Ranchers Reserve Ribeye as well as signature Moth favorites including Mother and Child Reunion and the Badass Bacon Waffle. 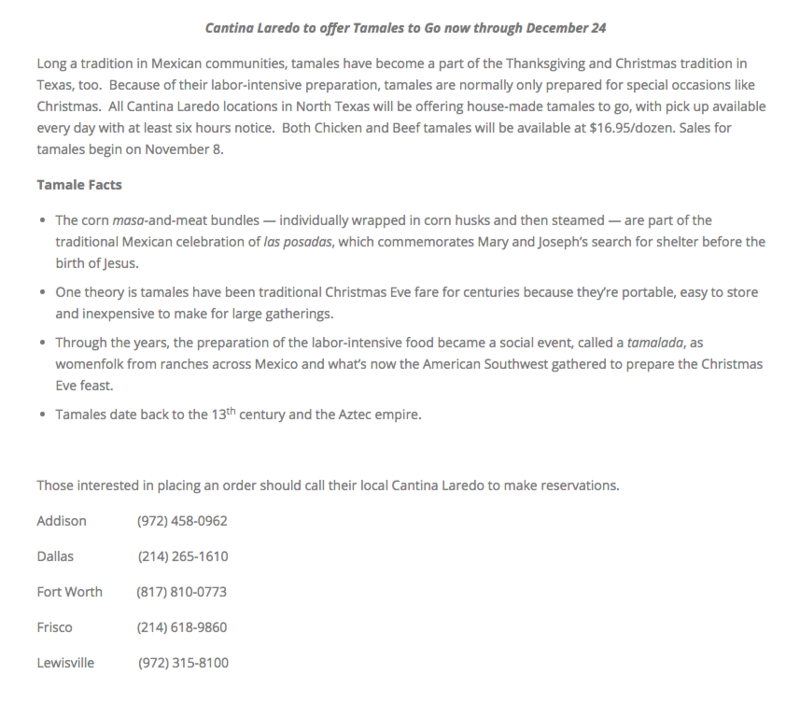 “The restaurant will offer its full dinner menu as well as a special three-course, prix-fixe dinner for $49.95. First course: butternut squash soup or honey crisp apple salad with dried cherries, walnuts and maple syrup vinaigrette. 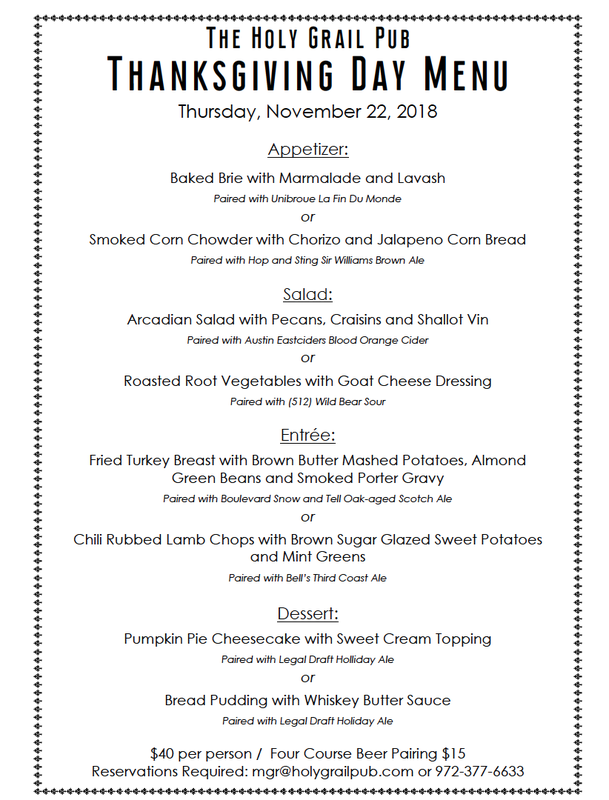 Second course: roast turkey breast with pan gravy and all of the traditional sides, including mashed potatoes, green bean almandine, sausage and sage cornbread stuffing and cranberry relish. Third course: pumpkin pie with chantilly cream. 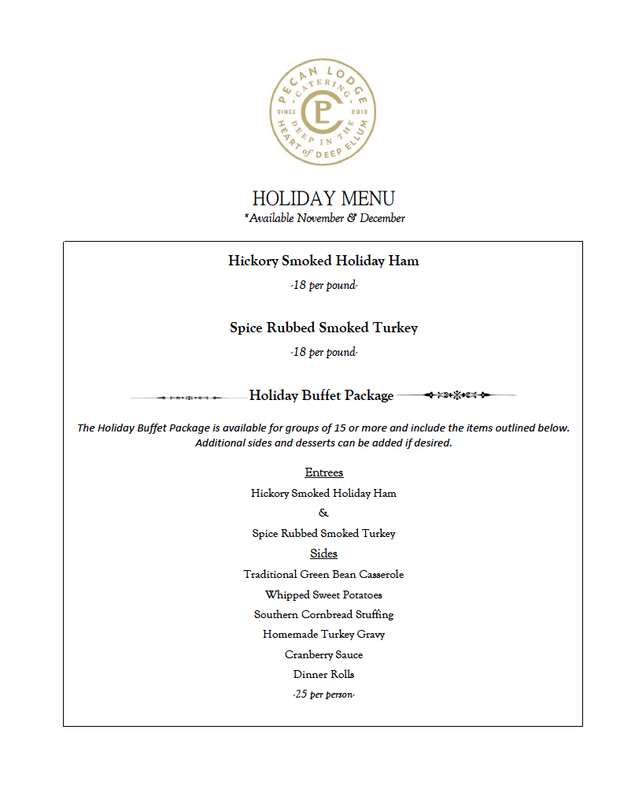 In addition, kids plates will be available for $15 and will include the roast turkey breast with pan gravy and all of the traditional sides. 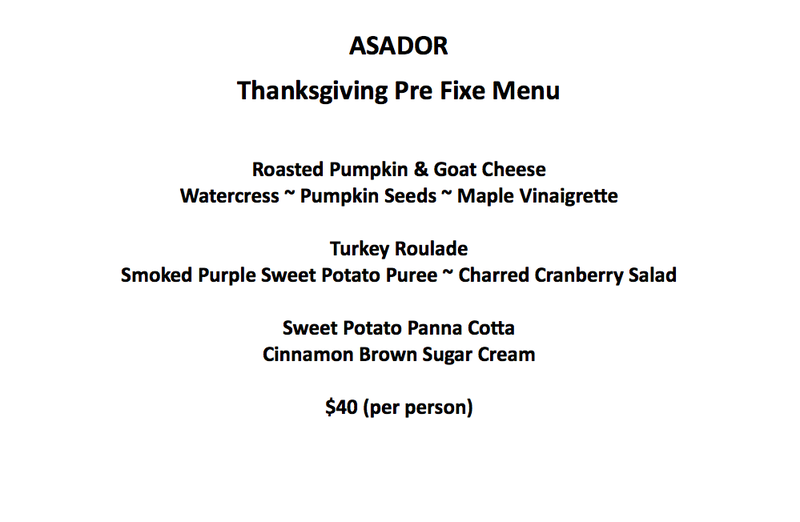 Salad, soup and dessert will also be available for additional purchase. 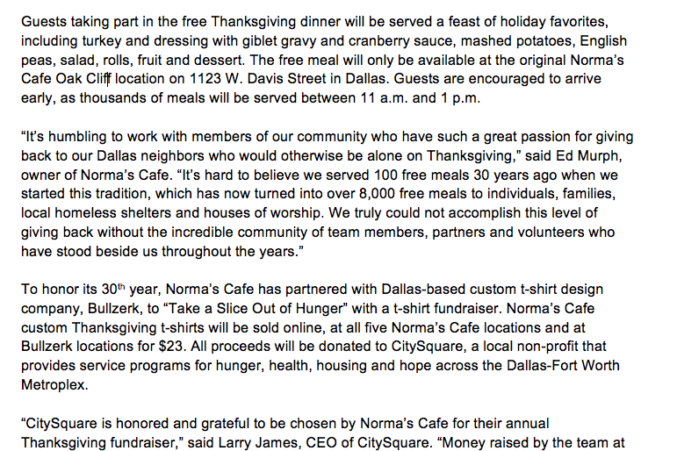 “Popular vegan eatery Nature’s Plate is serving up Thanksgiving suppers to-go ($25-$95). 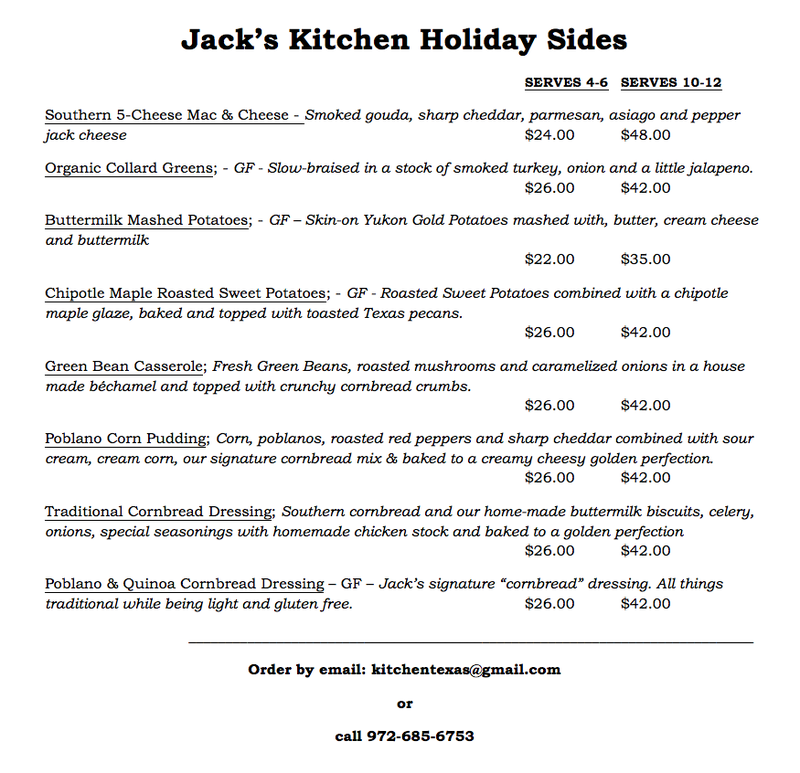 Acorn squash with quinoa wild rice stuffing, cheesy broccoli rice casserole, green bean casserole, baked sweet potatoes and apples, mashed potatoes with gravy and choice of pumpkin pie or cheesecake feed up to four people. 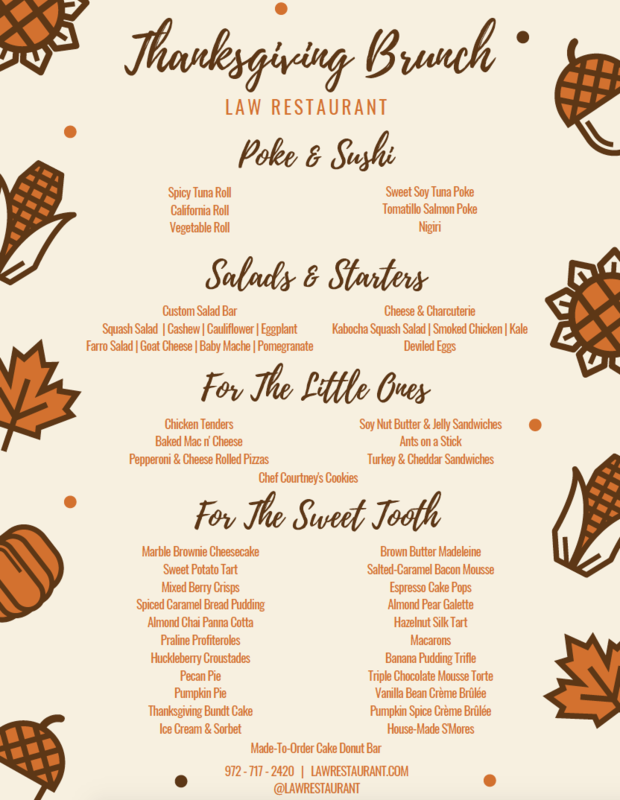 Family sized a la carte sides and desserts are also available for order at https://naturesplate.biz/collections/holiday-menu. All meals are fully cooked and ready for reheating. 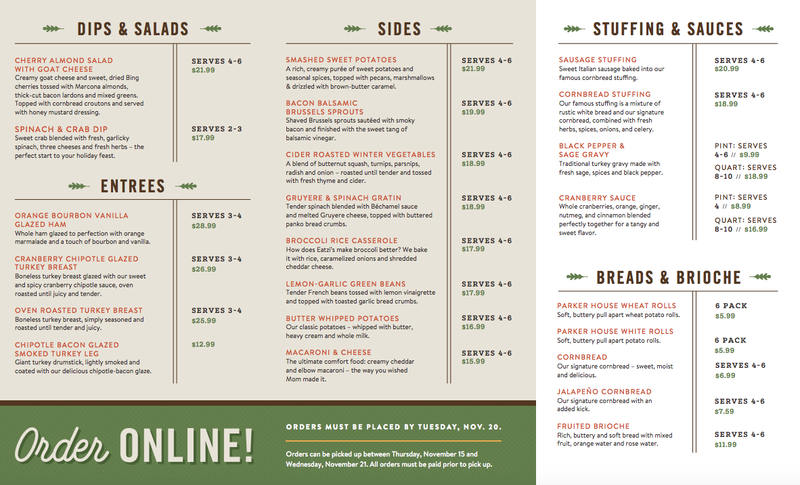 Order by Friday, November 16 at 7 p.m. for pick-ups beginning Tuesday from noon-7pm and Wednesday from 10 a.m. to 3 p.m. 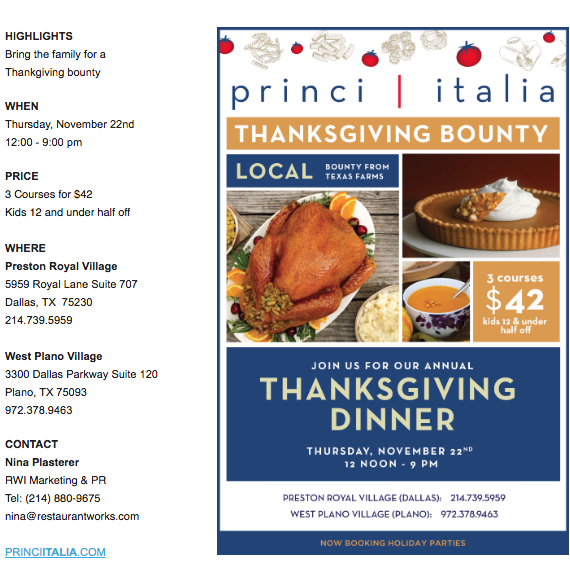 Pick up is available at either location in Lake Highlands and Preston Hollow. Nature’s Plate makes tasty and satisfying plant-based foods accessible and convenient using all non-GMO ingredients and organic whenever possible. 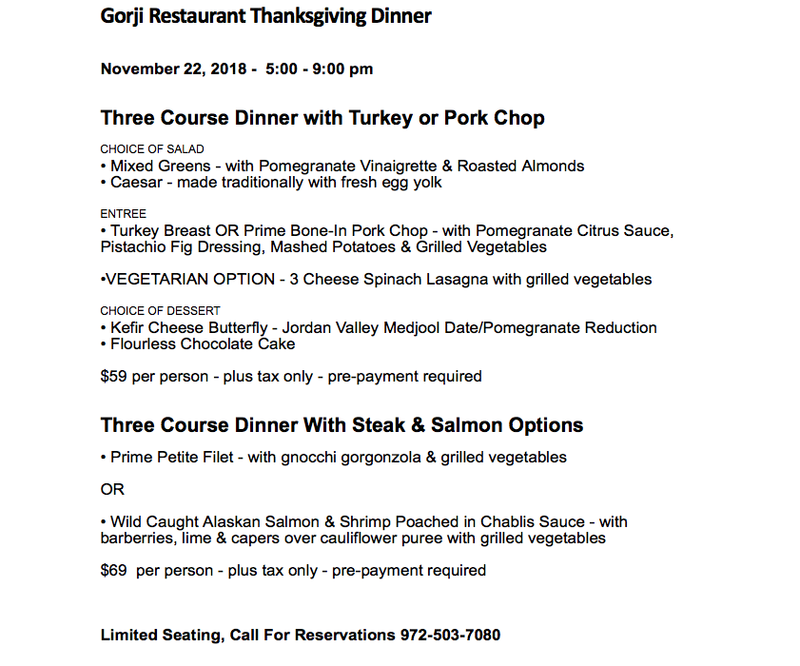 “From 11 a.m. to 7 p.m., guests may enjoy an exquisite three course Thanksgiving dinner, accompanied by the live music of Mike Nicosia. 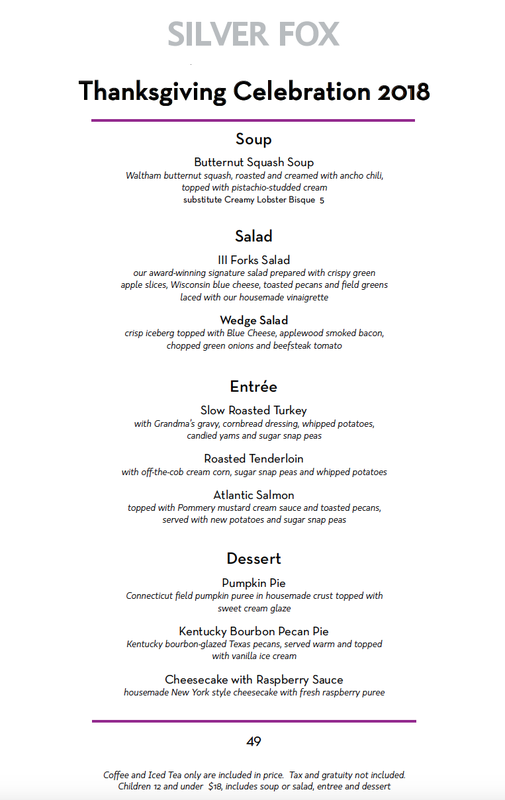 The prix-fixe menu begins with your choice of roasted pumpkin salad, lobster bisque, caesar salad, or Table 13 house salad; and features traditional roasted turkey breast, stuffing, roasted garlic mashed potatoes, homemade gravy, green beans, and cranberry sauce. Bread pudding tops off the holiday feast. 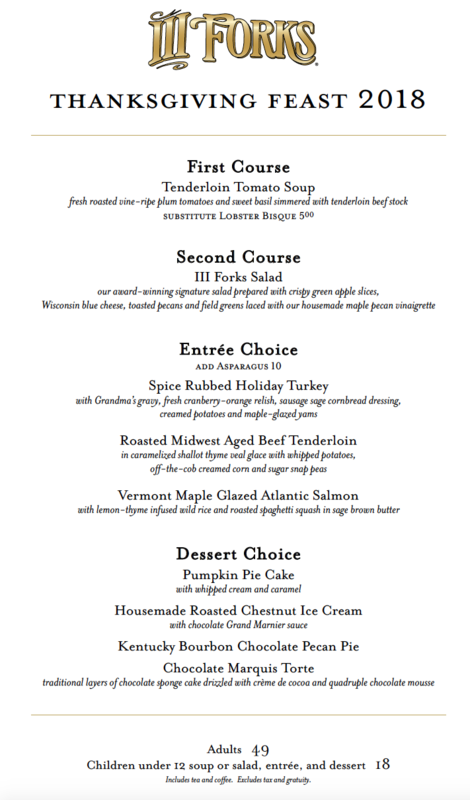 Mike Nicosia will perform from noon to 3 p.m. and 4 p.m. to 7 p.m.
Thanksgiving Dinner is only $36.95/person; $15/children under 12. 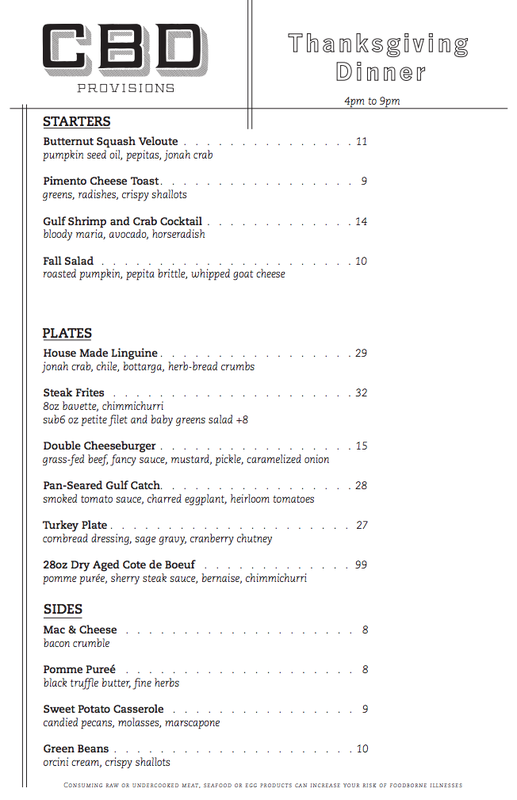 Select favorites from Table 13’s regular menu will also be available a la carte. 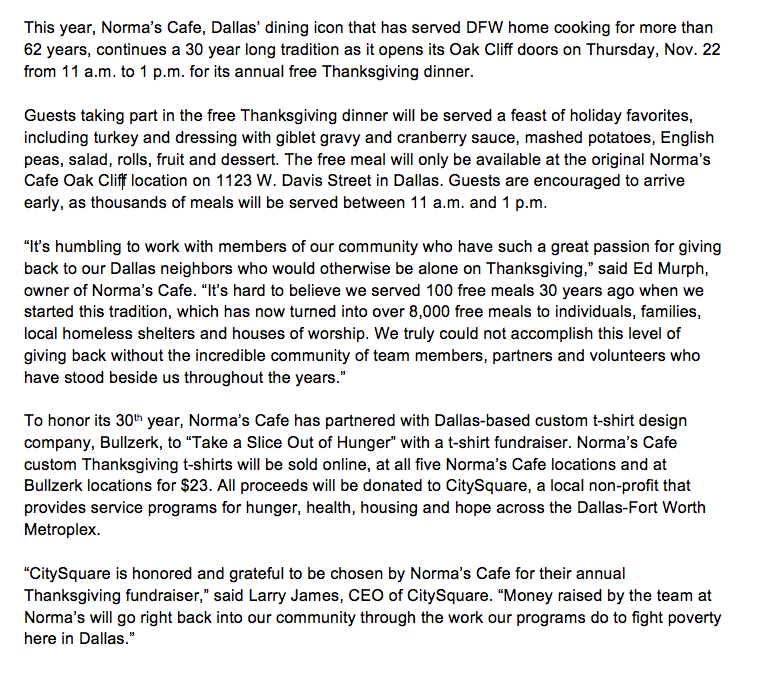 “City Works invites diners to visit and relax this Thanksgiving with a full fix of food, drink, and the Cowboys. 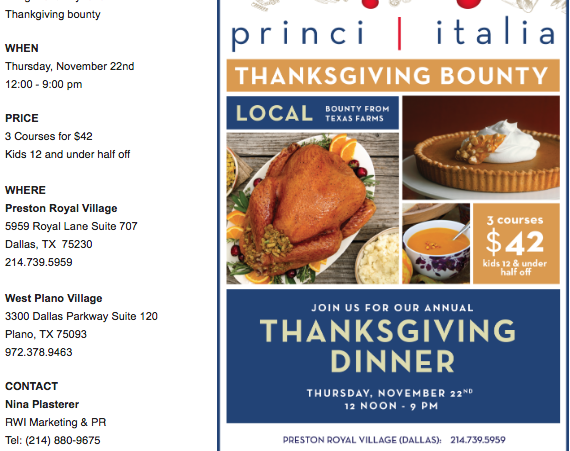 Guests can sit back with one of the 90-plus beers on draft and watch the Cowboys play at 3:30 p.m. on one of the massive 28 HDTVs while enjoying a Thanksgiving feast. 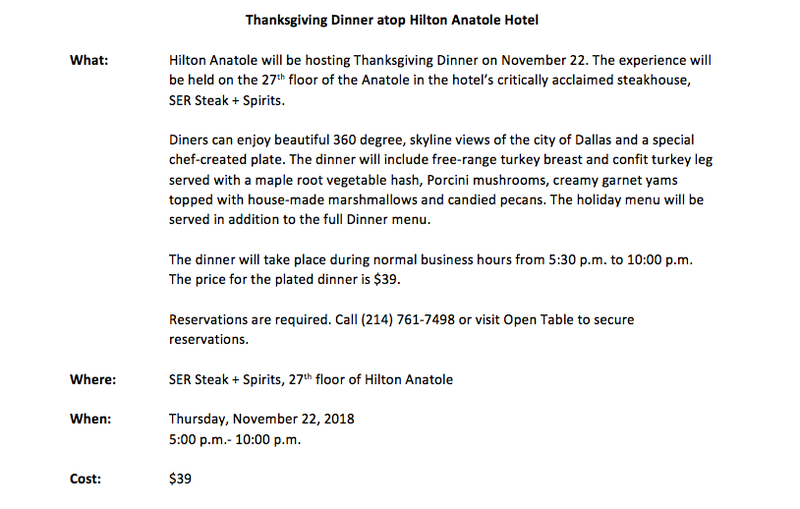 Guests can indulge in their choice of entrée: hand-carved slow roasted prime rib with horseradish cream and au jus, or hand-carved herb-roasted turkey with gravy, and also get access to the Thanksgiving sides buffet, featuring green bean casserole, Aunt Lori’s corn slop, creamy mashed potatoes, candied sweet potato mash, habanero cranberry sauce, Corn Bread and Andouille Sausage Stuffing, Smoked Cheddar Mac and Cheese, Collard Greens, roasted Brussels sprouts, bourbon-glazed carrots, and more. 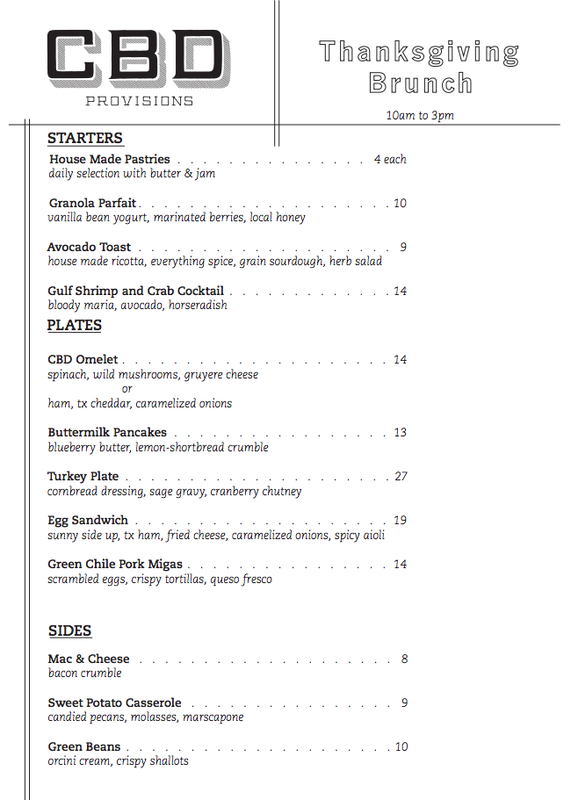 Additional menus items also available a la carte. City Works is open from noon to 8 p.m. on Thanksgiving. 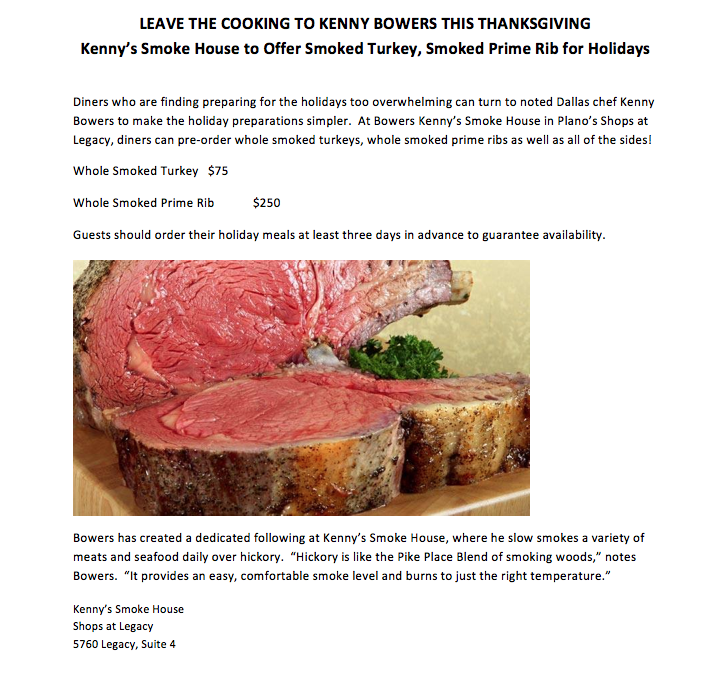 Slow-roasted prime rib dinner available for $30; Herb-roasted turkey dinner available for $25 (price includes sides buffet). 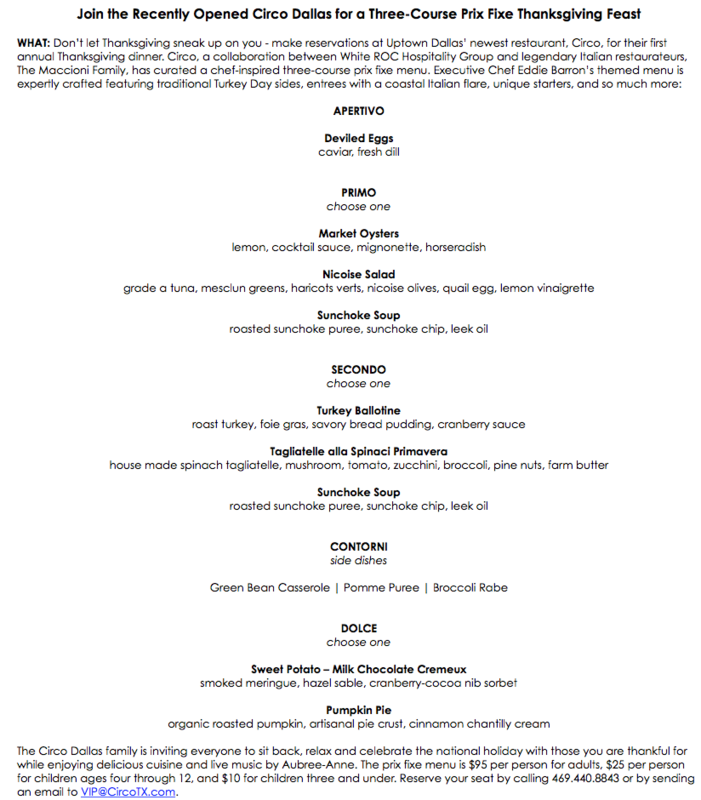 Reservations are encouraged. 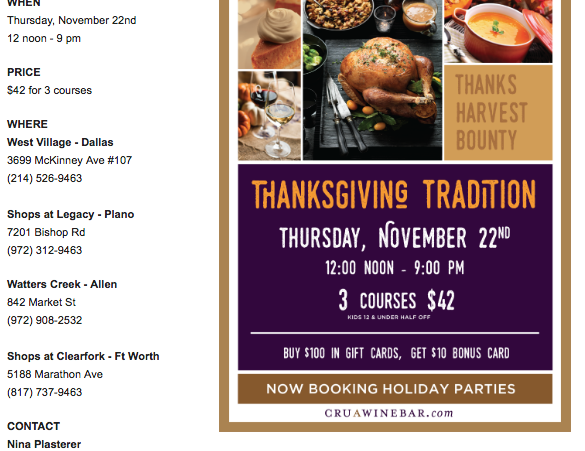 Visit https://www.cityworksrestaurant.com/frisco/ or call 469-850-1850.